In mouse the cytokine interleukin-7 (IL-7) is required for generation of B lymphocytes, but human IL-7 does not appear to have this function. A bioinformatics approach was therefore used to identify IL-7 receptor related genes in the hope of identifying the elusive human cytokine. Our database search identified a family of nine gene candidates, which we have provisionally named fibronectin immunoglobulin leucine-rich repeat (FIGLER). The FIGLER 1–9 genes are predicted to encode type I transmembrane glycoproteins with 6–12 leucine-rich repeats (LRR), a C2 type Ig domain, a fibronectin type III domain, a hydrophobic transmembrane domain, and a cytoplasmic domain containing one to four tyrosine residues. Members of this multichromosomal gene family possess 20–47% overall amino acid identity and are differentially expressed in cell lines and primary hematopoietic lineage cells. Genes for FIGLER homologs were identified in macaque, orangutan, chimpanzee, mouse, rat, dog, chicken, toad, and puffer fish databases. The non-human FIGLER homologs share 38–99% overall amino acid identity with their human counterpart. The extracellular domain structure and absence of recognizable cytoplasmic signaling motifs in members of the highly conserved FIGLER gene family suggest a trophic or cell adhesion function for these molecules. Interleukin-7 (IL-7) is a non-redundant cytokine required for the generation of B and T lineage cells in mice [1–5]. Although IL-7 is essential for T cell development in humans, human B cell development is unaffected by the absence of IL-7 or its receptors [6–8]. Despite extensive research, the predicted IL-7 equivalent for human B lymphopoiesis has so far eluded identification. An important clue, provided by recent studies showing that human hematopoietic progenitors develop into mature B cells after transplantation in immunodeficient mice, suggests that the molecules essential for human B cell development are either present in the mouse or can be provided by the transplanted human cells [9, 10]. In seeking a human B lymphopoietic cytokine/receptor pair, we reasoned that novel or orphan human receptors with structural features resembling those of the IL-7 receptor would be good candidates. A common feature of many cytokine receptors is the presence of Ig domains, fibronectin (FN) type III domains, and potential signaling capability . Ig domains define members of the Ig superfamily, which is the largest family of mammalian cell surface molecules, comprising approximately half of the leukocyte cell surface glycoproteins . FNIII domains are often found in molecules with adhesive function and can act as a spacer to ensure the correct positioning of functional sites . Using bioinformatic searches for transmembrane proteins with Ig domains, FNIII domains, and signaling potential, nine human genes were identified that fulfilled the search criteria. These encode type I transmembrane glycoproteins, with 6–12 leucine-rich repeats (LRRs), one C2 Ig domain, one FNIII domain, a transmembrane domain, and a tyrosine containing cytoplasmic domain. The genes have been provisionally named fibronectin immunoglobulin leucine-rich repeat (FIGLER) 1–9. In contrast to the known cytokine receptors, the predicted FIGLER molecules have a unique domain structure, marked by the N-terminal LRRs and an unusual genomic organization. Two previously described molecules that combine LRR, Ig and FNIII domains with unknown signaling capacities and function are included in this family, namely the photoreceptor-associated LRR superfamily member (PAL) and the neuronal leucine-rich repeat protein 3 (NLRR3) [14–22]. Here, we describe the features and expression patterns of the human FIGLER family members and identify multiple non-human orthologs. Over 3000 nucleotide and amino acid sequences of hypothetical proteins, as defined by the NCBI database, were analyzed by SMART and BLAST to determine domain structure and sequence similarity to known molecules. The initial screening of the human NCBI Genome Database led to the identification of a hypothetical gene that was predicted to encode a protein with IL-7 receptor-like structure in that it possessed both Ig and FNIII domains. The predicted amino acid sequence was then used to search NCBI's BLAST protein database, leading to the identification of eight other related molecules in humans (Figure 1 and Table 1). Based on analysis using the SMART database, each of these proteins is predicted to contain 6–12 LRR, one C2 Ig domain, one FNIII region, one hydrophobic transmembrane region and one to four cytoplasmic tyrosines. These molecules were provisionally named fibronectin immunoglobulin leucine-rich repeat (FIGLER) 1–9. Although the FIGLER genes are dispersed in the genome, the predicted amino acid sequences of the nine FIGLER molecules share 20–47% overall amino acid identity. Tyrosines are present in each of the FIGLER cytoplasmic regions, although they are not located within currently recognizable signaling motifs. Further analysis of the predicted amino acid sequences indicated that FIGLER 5 and FIGLER 9 correspond to the previously described NLRR3 and Pal genes [16, 21, 22]. Percentage amino acid identity. Pairwise analysis of each FIGLER domain was performed using the Megalign CLUSTALW method algorithm, with FIGLER 1 serving as the index of comparison. Percent amino acid identities are indicated and aligned in relation to the FIGLER 1 domains. The identity percentage scoring employed here did not penalize for shortened cytoplasmic tails or the presence of < 8 LRRs. Human FIGLER molecules. Schematic representation of human FIGLER molecules 1–9 detailing extracellular motifs and intracellular tyrosines. LNT, N-terminal leucine-rich repeat; L, leucine-rich repeat; LCT, C-terminal leucine-rich repeat; Ig, C2 type Ig domain; FN, FN type III domain. As this study was directed initially toward identification of genes that might influence human B lymphopoiesis, RT-PCR analysis of FIGLER gene expression was performed on fetal bone marrow B lymphocyte subpopulations, bone marrow stromal cell lines, fetal thymus, and the non-B cell fraction in bone marrow. PCR products were cloned and sequenced to confirm their identity (data not shown). FIGLER 9 (Pal) served as a negative control gene in these experiments, as it was previously shown to be retina-specific (Figure 2A) . The analysis indicated that FIGLER 1,2,3, and 5 mRNA transcripts were expressed in primary B lineage cells. FIGLER 1 expression began at the immature sIgM+ B cell stage. FIGLER 2 expression was detected at low levels in pro-B cells and in the CD34+CD19- cells, a heterogeneous population that includes hematopoietic stem cells. FIGLER 3 expression was initiated at the pro-B cell stage, and FIGLER 5 expression began at the pre-B cell stage. FIGLER 1 and 5 were also expressed by non-B lineage BM cells. Only FIGLER 2 was found to be expressed in human stromal cell lines. FIGLER 4,6,7 and 8 could not be detected in any of the bone marrow-derived cells examined, despite multiple attempts and the use of three or more different gene-specific primer pairs per gene. To examine the FIGLER gene expression pattern further, we analyzed representative hemopoietic cell lines, B, T, myeloid and erythroid (Figure 2B). The up-regulation of FIGLER 1 expression observed as a function of normal B cell development was also observed in representative B lineage cell lines, although the OB5 pre-B cell line had relatively high levels compared to the normal pre-B cells. FIGLER 1 and 2 were expressed weakly in the thymus and in the Jurkat T cell line, whereas they exhibited reciprocal expression patterns in myeloid cell lines. The K562 erythroid cell line did not express any of the FIGLER genes. Surprisingly, given their robust expression in primary cells of bone marrow origin, FIGLER 3 and 5 were not detected in any of the cell lines tested, nor were FIGLER 6, 7, and 8 (data not shown). As the NCBI EST profile database did not contain bone marrow or spleen expression data for the FIGLER molecules, this constitutes the first evidence for expression of these molecules in the bone marrow and B lineage cells in particular. Analysis of FIGLER expression in hematopoietic cells and cell lines. (A) RT-PCR analysis of human FIGLER 1–5 mRNA transcripts. Panel 1, primary bone marrow B lineage cells: CD34+CD19-, hemopoietic stem cells and other early hemopoietic cells; CD34+CD19+, pro-B cells; CD34-CD19+IgM-, pre-B cells; and CD34-CD19+IgM+ B cells. Panel 2, bone marrow-derived stromal cell lines. Panel 3, primary thymus and bone marrow non-B lineage cells. (B) RT-PCR analysis of FIGLER 1, 2 and 9 mRNA transcripts in human pro-B (REH, Nalm16), pre-B (697, 207, OBS), B (Ramos, Daudi, Raji), T (Jurkat), myeloid (THP-1, U937, HL-60, KG-1), and erythoid (K562) cell lines. FIGLER 9 (Pal), a retina specific protein, served as a negative control and β-actin served as a loading control for all these analyses. PCR product identity was confirmed by sequencing as described in the Methods section. Putative FIGLER orthologs were found in macaque, chimpanzee, orangutan, mouse, rat, dog, chicken, toad, and puffer fish NCBI databases using the BLASTN algorithmic search for homology to the identified human FIGLER gene sequences (Tables 2, 3, 4, 5). Hidden Markov model searching of GenBank led to the identification of five potential new FIGLER orthologs in Takifugu rubripes, although little information is available about these molecules except amino acid sequence (data not shown). As was the case for their human counterparts, these genes were found to be located on different chromosomes. All FIGLER orthologs contained 6–12 LRR, a single C2 type Ig domain, a FN type III domain, a hydrophobic transmembrane domain, and from one to seven cytoplasmic tyrosines. The predicted amino acid sequences of the FIGLER homologs shared 38–99% overall identity with their human counterpart. Phylogenetic tree analysis was performed to cluster the non-human FIGLER molecules to their nearest human FIGLER homolog (Figure 3). The alternative names, chromosomal locations, predicted amino acid length, and accession numbers of the human FIGLER and non-human FIGLER molecules are listed in Tables 6 and 7. Phylogenetic analysis of the FIGLER family of molecules. Phylogenetic analysis of the molecule coding amino acid sequence region of the FIGLER family members. The CLUSTALW algorithm was used for multiple sequence alignment of divergent sequences after the variable length LRR regions were masked out. The chromosomal regions of the human and mouse FIGLER genes were compared to further examine their relatedness. The positions of neighboring upstream and downstream genes were found to be highly conserved, but the regions containing the mouse FIGLER genes were inverted relative to the orientation of human FIGLER chromosomal regions. This is illustrated for FIGLER 1 and mouse FIGLER 1 (Figure 4). By contrast, the non-mouse FIGLER genes have the same chromosomal orientation as their human FIGLER counterparts (data not shown). Human/mouse homology map for FIGLER 1. The chromosomal locations and transcriptional orientation of the human and mouse FIGLER 1 and flanking genes were determined using the NCBI GenBank Mapview Database. Black ovals denote the centromere. As the known NLRR3 (FIGLER 5) and Pal (FIGLER 9) genes have been shown to have an unusual three exon structure, we analyzed the predicted exon structure of the entire FIGLER gene family (Figure 5). 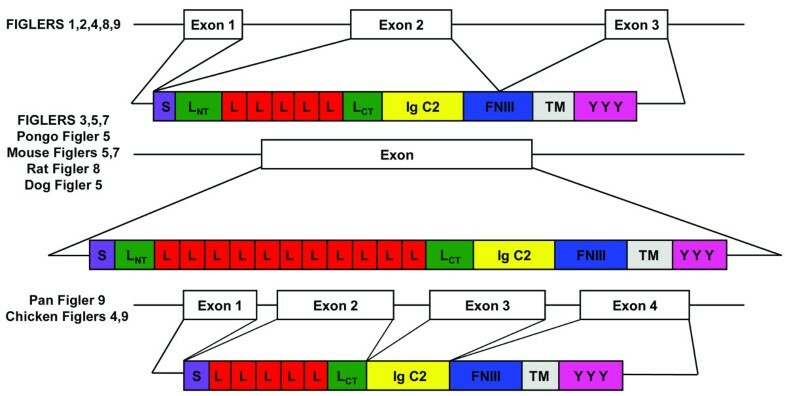 Most of the human FIGLER and non-human FIGLER genes have the same atypical 3 exon structure, in which exon 1 contains the 5' untranslated region; exon 2 encodes the signal peptide, LRR, Ig domain, and part of the FNIII domain; and exon 3 encodes the remaining FNIII region, transmembrane region, cytoplasmic tail, and 3' untranslated region. 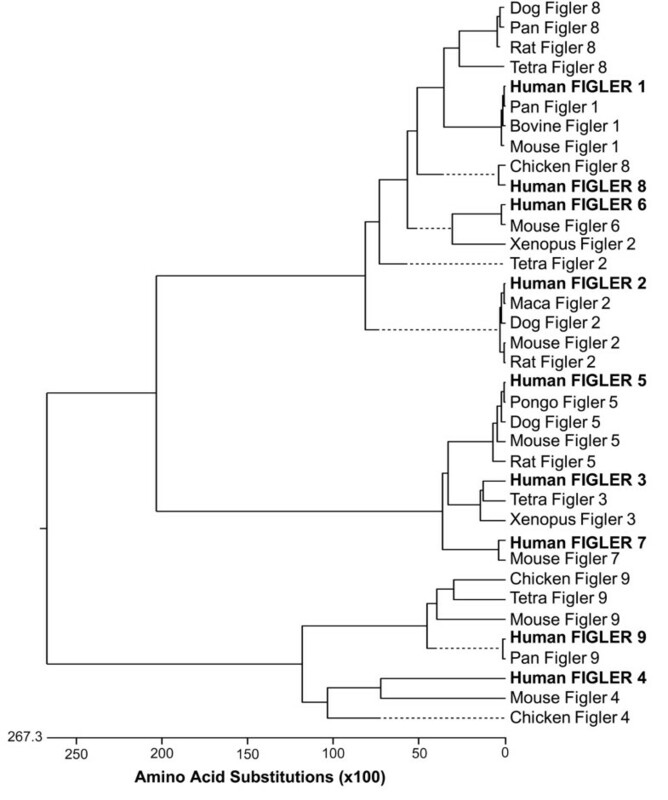 Human FIGLER 3, 5, and 7, chimpanzee FIGLER 5, mouse FIGLER 5 and 7, rat FIGLER 8, and dog FIGLER 5 are encoded by a single exon. Interestingly, chimpanzee and chicken FIGLER 9 and chicken FIGLER 4 have a more standard exon organization, in which exon 1 contains the 5'untranslated region, exon 2 encodes the LRRs, exon 3 contains the Ig domain, and exon 4 encodes the FNIII region, transmembrane domain, cytoplasmic tail and 3'UTR. Predicted genomic structure and protein product of human and non-human FIGLER molecules. S, Signal Peptide; LNT, N-terminal leucine-rich repeat; L, leucine-rich repeat domain; LCT, C-terminal leucine-rich repeat, Ig, C2 type Ig domain; FNIII, FN type III domain; TM, hydrophobic transmembrane domain; Y, tyrosine in predicted cytoplasmic domain. Non-human FIGLER genes not listed in this schematic have the same three exon structure as human FIGLER 1, 2, 4, 8, and 9. 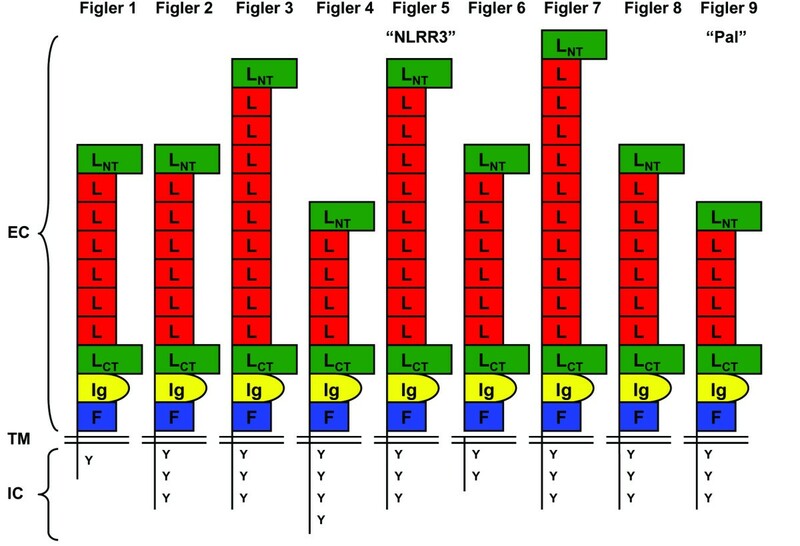 The nine human orphan receptors identified here were named FIGLER to emphasize their unique combination of FN, Ig, and LRR domains. The tyrosines present in their cytoplasmic regions may indicate signaling potential, although they were not found to be embedded in known consensus signaling motifs. The FIGLER genes encode molecules that share 20–47% amino acid identity and similar structure despite their widespread distribution in the genome. Although our initial goal was to identify a novel IL-7-like receptor, the FIGLER molecules differ from known cytokine receptors in that they have LRR domains on the N-terminal end of the protein. The LRRs are characterized by specific leucine and asparagine residue spacing and are found in proteins with diverse functions and cellular distribution [14, 15, 17, 21, 22]. LRRs also are found in other molecules that are expressed by B cells, such as Toll-like receptors 9 and 10 . As we sought to identify molecules that could potentially influence human B lymphopoiesis, FIGLER expression was analyzed in hematopoietic and lymphoid tissues. FIGLER 1,3, and 5 mRNA expression was found to be up-regulated as a function of human B cell development, whereas FIGLER 2 was expressed throughout development and in non-B lineage cells. The identification of FIGLER relatives in macaque, cow, chimpanzee, orangutan, mouse, rat, dog, chicken, toad and puffer fish that share 38–99% amino acid identity to their human counterparts indicates that this is a conserved gene family. All of the members encode type I transmembrane proteins, and each gene is located on a different chromosome, except for the chimpanzee FIGLER 1 and 8, which are both located on chromosome 19. Based on human FIGLER and mouse FIGLER gene chromosomal analysis, it is likely that the human and non-human FIGLER genes are homologs that were derived from common ancestral genes. 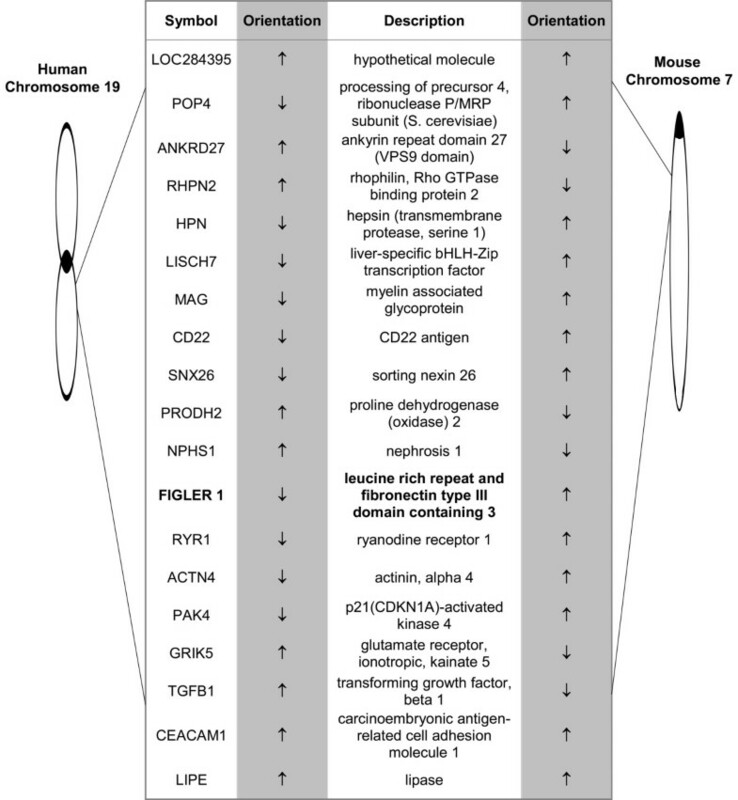 Intriguingly, the mouse FIGLER genes are located on inverted chromosomal segments relative to their human syntenic regions, although FIGLER genes in other species have the same orientation as their human counterparts. As the known NLRR3 (FIGLER 5) and Pal (FIGLER 9) genes have been shown to have an unusual predicted exon structure, we determined the exon structure of the entire FIGLER gene family [16, 21, 22]. Most of the human FIGLER and non-human FIGLER genes have the same atypical 3 exon structure, in which exon 1 contains the 5' untranslated region; exon 2 encodes the signal peptide, LRR, Ig domain, and part of the FNIII domain; and exon 3 encodes the remaining FNIII region, transmembrane region, cytoplasmic tail, and 3' untranslated region. Ig domains are almost universally encoded by a single exon, which in part is thought to have accounted for their ready dispersal in the genome and widespread utilization in cell surface glycoproteins with multiple functions. Human FIGLER 3, 5, and 7, chimpanzee FIGLER 5, mouse FIGLER 5, mouse FIGLER 7, rat FIGLER 8, and dog FIGLER 5 are all intronless genes, suggesting their integration into the genome via reverse transcription. Nevertheless we have demonstrated cellular expression for all but FIGLER 4 and 6–8, and all of these genes are predicted to encode an intact open reading frame. Finally, the chimpanzee and chicken FIGLER 9 genes and chicken FIGLER 4 have a more typical organization, and the Ig domain is encoded by a separate exon. The functions of the FIGLER gene products are presently unknown. FIGLER 5 and 9 are identical to the previously identified Pal and NLRR3. Pal is a type 1 transmembrane protein that is preferentially expressed in the retina, where it is up-regulated during photoreceptor outer segment development. As for the other FIGLER family members, Pal lacks recognizable signaling motifs in its cytoplasmic tail and is predicted to act as a trophic factor receptor or adhesion molecule . NLRRs were identified through screening of a mouse brain cDNA library, and homologs have been found in Xenopus, rat, and human brain tissue [18–20, 24, 25]. All of the NLRR members are expressed predominately in the central nervous system . Of the three known mouse NLRRs, only NLRR3 is up-regulated with brain injury, thereby suggesting its involvement in injury recognition or repair . While several of the FIGLER molecules described here are expressed in B lineage cells and the expression of FIGLER 1, 3, and 5 is developmentally regulated within this lineage, the possibility that these molecules are involved in the interaction between B lineage cells with the supportive bone marrow microenvironment remains speculative. The nucleotide sequence, amino acid sequence and domain structure of the human IL-7 receptor α chain (NM_002185) was used in the basic local alignment search tool (BLAST) and simple modular architecture research tool (SMART) database searches for novel IL-7 receptor α chain relatives [27–29]. The National Center for Biotechnology Information (NCBI), European Molecular Biology Laboratory (EMBL), Ensembl, and DNA database in Japan were all queried, including the expressed sequence tags (EST) and high throughput genomic sequences (HTGS) databases. The predicted human FIGLER sequences were used to identify homologs in other species using BLASTN algorithmic and hidden Markov model (HMM) searches of the NCBI and GenBank databases. HMM hits were filtered through Pfam according to their domain composition. The NCBI genome database was used to align the predicted mRNA sequences to the genomic sequences and determine intron-exon boundaries. The human BLAST-like alignment tool (BLAT) database (University of California at Santa Cruz) and Megalign CLUSTALW method algorithm (Windows version 3.12e; DNASTAR, Madison, WI, USA) were used to design primers and determine amino acid identity among the newly identified FIGLER molecules. The molecular coding amino acid sequence region phylogenetic tree analysis of the FIGLER molecules as listed in the GenBank database was conducted using the CLUSTALW method algorithm of Megalign . The variable length LRR regions were masked out during phylogenetic analysis in order to compensate for sequence length. Human stromal cell lines included the WW, WWX, and stromal 8 lines, which were derived from bone marrow samples in our laboratory. B lineage cell lines were REH and Nalm 16 (pro B cell); 697, 207, and OB5 (pre B cell); and Ramos, Daudi, and Raji (B cell). Myeloid cell lines included THP-1 (monocytic), HL-60 (promyelocytic), U937, and KG-1 (myelocytic). The Jurkat T cell line and K562 erythroid cell lines were also used in this analysis. Human adult bone marrow was obtained from resected ribs of healthy renal transplant donors in accordance with policies established by the University of Alabama at Birmingham Institutional Review Board. The resected ribs were processed within 24 h of obtainment, and lymphoid cells were isolated by Ficoll-Hypaque gradient centrifugation (Mediatech, Herndon, VA, USA). B lineage cells were isolated from the bone marrow samples using a MACS B cell Isolation Kit (Miltenyl Biotec, Auburn, CA, USA). The isolated primary B lineage cells were resuspended in FACS buffer (FACS buffer: PBS plus 2% FBS) and incubated for 20 min at 4°C with CD34-APC, CD19-PE, and IgM-FITC labeled antibodies (BD Biosciences, Palo Alto, CA, USA). The cells were then sorted based on their differential CD34, CD19, and IgM expression into four B lineage populations: CD34+19-, CD34+19+, CD34-19+IgM-, and CD34-19+IgM+, using a MoFlo instrument (Cytomation, Fort Collins, CO, USA). Human fetal bone marrow and thymus samples used for RT-PCR analysis were obtained in accordance with policies established by the University of Alabama at Birmingham Institutional Review Board. Lymphocytes from 12-to 29-week fetal bone marrow and thymus were obtained by sedimentation at 100 g over a lymphocyte separation medium for 30 min at room temperature. The cells recovered at the interface were washed in PBS containing 5% FCS and 2 to 4 × 107 cells. B lineage cells were isolated from the bone marrow and thymus samples using a MACS B cell Isolation Kit. Total RNA was isolated from isolated populations of primary fetal bone marrow B lineage cells, primary fetal thymic T lineage cells, hematopoietic cell lines, and stromal cell lines using TRIzol (Invitrogen, Carlsbad, CA, USA). cDNA was generated from the isolated mRNA using Superscript First Strand Synthesis System for RT-PCR, per the manufacturer's suggestions (Invitrogen). The following gene specific primers were used to amplify each gene via PCR using Platinum Taq DNA Polymerase (Invitrogen): FIGLER 1, forward 5'-CTGCTAGGCAACTCAAGC-3' and reverse 5'-GATAGGCCGCTGATCCG-3'; FIGLER 2, forward 5'-GCTACTTCTGGCATGTGC-3' and reverse 5'-ACCACTGTCCTGAGATGT-3'; FIGLER 3, forward 5'-CAGTACAGCCCTTGCTG-3' and reverse 5'-CCACATGTAATAGCTTG-3'; FIGLER 4, forward 5'-CTCGTGGTGACCAGTACT-3' and reverse 5'-AGCTTCTGTCACGTCTGC-3'; FIGLER 5, forward 5'-CAGCAATGCTCTCAGTGC-3' and reverse 5'-TCGAGCACTTTGCGCAG-3'; FIGLER 9, forward 5'-TCTCAATGCAGCTGCAGC-3' and reverse 5'-GCTGGCACATCTCAGTTC-3'. Each amplification reaction underwent an initial denaturation of 94°C for 2.5 min, followed by 35 cycles of annealing at 55°C for 1 min, extension at 72°C for 1 min, denaturation at 94°C for 1 min, and a final extension at 72°C for 10 min. The PCR products were separated by agarose gel electrophoresis, and their identity was verified via sequencing after cloning into a TOPO TA pCR2.1 Vector (Invitrogen). DNA sequencing was accomplished for both strands by the dideoxy chain termination method using Thermo Sequenase (Amersham Biosciences Corp, Piscataway, NJ, USA), per the manufacturer's suggestions, and an automated sequencer (LiCor, Lincoln, NE, USA). Delicia L Munfus, Christopher L Haga contributed equally to this work. We thank our University of Alabama at Birmingham colleagues for helpful advice, Randall Davis, for providing cell lines, and Larry Gartland, for cell sorting expertise. These studies were supported in part by NIH grants AI39816 (MDC) and AI48098 (PDB). DLM conducted the primary database searches, analysis, RT-PCR experiments, and manuscript preparation. CLH contributed to database searches, analysis, experimental design, interpretation, and manuscript preparation. PDB contributed to the experimental design, analysis, interpretation, and manuscript preparation. MDC contributed to the experimental design, interpretation, and manuscript preparation. All authors have read and approved the final manuscript.